A great deal has been talked about the economic recovery of Western Germany since the Second World War. It is know htat this recovery was accompanied by the return of the Federal Republic to the markets of the world. 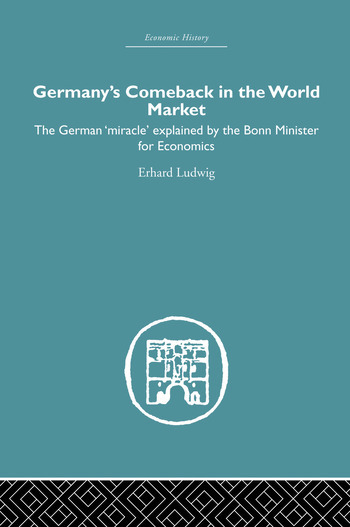 Not so much is know abotu the details - about the work effected through the opitimism of the Minister for Economics, Professor Ludwig Erhard. In this book, the minister himself speaks. A detailed description is given of the stages by which first the Bizone, and then the Federal Republic, has effected the remarkable comeback which has created keen interest and concern. The book goes into the full detail which might be expected from on who is in charge of the entire machinery. The description of the way in which Government policy was employed to stimulate a free market economy is of great technical interest. Equally important is the detailed description of the way in which every nook and cranny is exploited to give the Federal Republic a foothold in foreign markets. No opportunity is neglected, from the fostering of the most ambitious long-term capital development schemes to the publication of day-to-day reports on trade openings. This book was first published in 1954.